I was going through the grocery store one fine night, and as I wandered down the cookware aisle where they have those crummy pots and pans and corn holders and stuff that you only buy in a real emergency, and this one knife caught my eye. Amazing, eh? The Good Cook quality control was asleep at the wheel or something. Yes, that is a spider or insect of some sort. 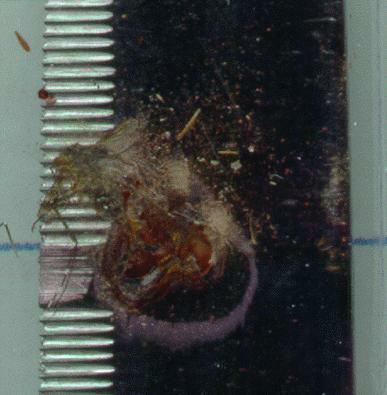 With real blood and some other nasty bits. Packed right in there. If anybody has some interesting thoughts about what to do with this, please feel free to let me know! 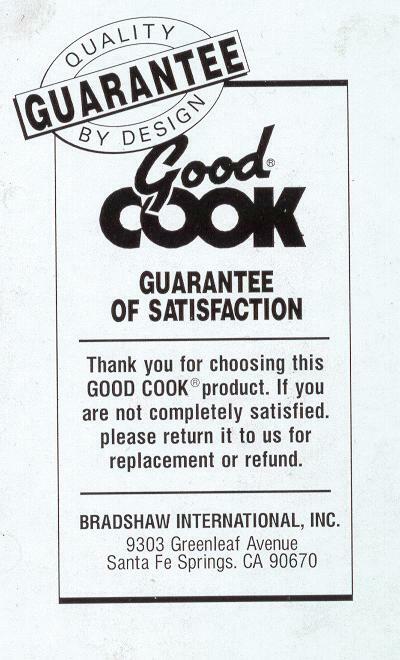 I find it especially ironic that they have this wonderful quality guarantee thing right on the back. I also think it's wonderful that they let insects into their work areas. Bugs are living beings too, you know. But you really shouldn't be smashing them into your cutlery. The moral of the story: unclear. But wash your dishes well, please. Have fun!! !